WEEKEND INTERVIEW WITH KORELIN ECONOMICS: IS THE BUBBLE PHASE ABOUT TO BEGIN? I think the manipulation after QE4 has accelerated the bull market. We now have the necessary conditions for the bubble phase in gold to begin. I was expecting the second phase correction (the correction that separates the second phase of the bull market from the bubble phase) to occur at the next 8 year cycle low due in 2016. However I think the manipulation of the precious metals markets over the last 8 months has probably shortened the bull market. Contrary to what many believe manipulation doesn’t delay a market. Manipulation accelerates and intensifies the secular trend as it creates supply and demand imbalances. Once the market breaks free of the manipulation the trend reverses and ultimately goes much further and much more violently in the secular direction than would have occurred normally. If the metals had been allowed to trade freely then I think we would have gotten another C-wave advance into 2014, followed by a devastating correction into the 8 year cycle low in 2016. That move into the 8 year cycle low would have marked the transition from the second phase to the bubble phase. However the metals weren’t allowed to trade freely after QE4. They were continually hit with artificial & manipulative selling in the over night and premarket for months. I think this has converted what should have been just a normal correction into the second phase correction, and when gold breaks free it’s going to deliver the bubble phase over the next two years instead of in 2017/18 that would have occurred in a natural market. Whether you think I’m right or not, pretty much every bubble has to have one of these extreme corrections to completely cleanse bullish sentiment before starting. In 2007 oil dipped 37% convincing everyone that the peak oil crowd were idiots. Oil then rallied 200% in the next year and a half vindicating the bulls and making the critics look foolish. In 1998 the NASDAQ corrected 40%. Everyone was convinced the secular bull had ended. It had not ended, but the correction did clean the slate and prepare the market for tech stocks to rally 300% in the next year and a half. Gold has just corrected 37%, miners almost 70%. No one even believes that gold will ever see $1900 again, much less many multiples higher than that. Yet gold has now put in place the necessary conditions for a bubble to begin. And all big secular bull markets end in bubbles.Human nature never changes. The fundamentals driving gold have not changed. In fact I would suggest the supply side has been severely damaged as many tons of physical gold has moved from west to east during the manipulation event. That gold is never coming back. It’s going to remain locked up inside eastern central banks, and in the hands of Asians for years to come. It’s always when it looks least likely that major trend changes occur. Watch gold next week. 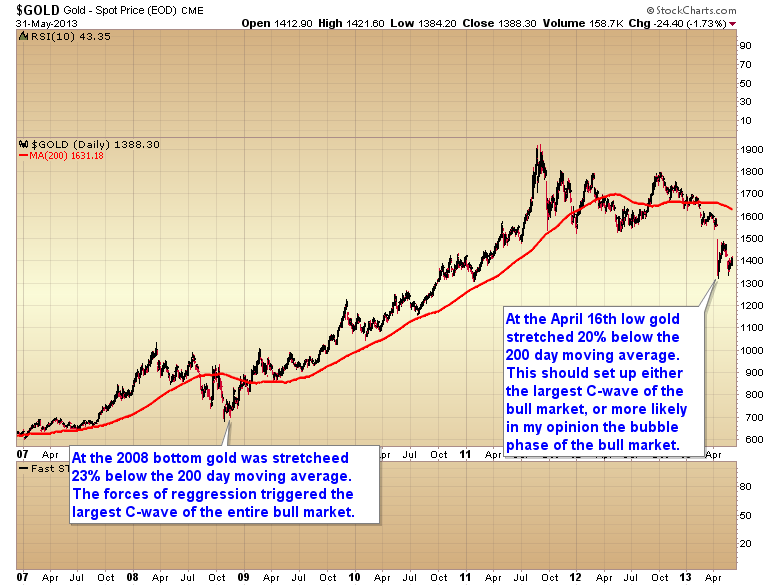 If the bubble phase is beginning then we should see gold rebound violently as it breaks free of the manipulation. Miners in particular should rally 10-15%. If gold waffles around coming out of this bottom then the correction isn’t done yet. But either way, whether it ended on Friday or the bottom is still ahead of us, I think this correction is creating the conditions necessary for the bubble phase to begin. This entry was posted in Uncategorized on June 30, 2013 by Gary. In the weekend report I told subscribers that Bernanke would throw everything he had at the market early in the week to try and abort the market correction. I described it as a war would be fought. That war is certainly playing out. If the Fed can push stocks back above 1654 then Bernanke is going to win the war, and the parabolic advance in stocks will continue. On the other hand if the S&P drops below 1560 then the Fed has lost the war and stocks will complete their natural tendency to regress to the mean. If the S&P closes back above $1600 today than the Fed has won an important battle for control of the market. This entry was posted in Uncategorized on June 26, 2013 by Gary. 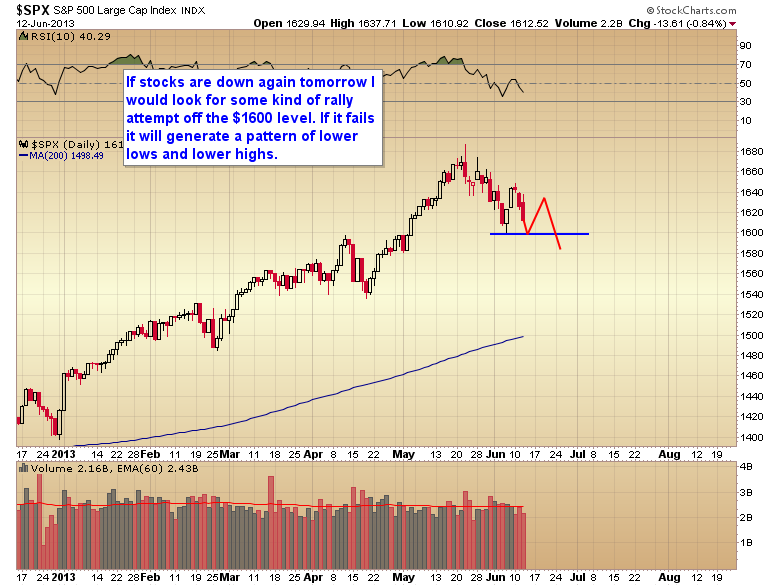 It appears the stock market crash/semi-crash may be getting underway. The bond market is certainly coming unraveled. This is what happens when the Fed tries to force the market to do something it isn’t meant to do. It will behave for a while, but ultimately everything comes unglued and the end result is much worse than if the market had been allowed to function naturally. We saw the result of the Greenspan Put from 2002-2007. It ended with the second worst bear market and economic recession in history. This time will be no different. The Fed has held rates artificially low for many years. I think the market has decide enough is enough and now the reversal is happening much faster and more violently than would have occurred normally. 85 billion a month is not going to be nearly enough to stop the rout in the bond market. The S&P has already lost all the gains from April & May, if we lose March also the market will be set up for the crash or semi-crash I’ve been predicting as everyone tries to get out the door at the same time and salvage something before it’s all gone. The crash in bonds and stocks is in my opinion the setup for the next leg of the commodity bull market. Ben is going to have to massively increase QE to try and regain control of the bond market (only temporarily) and reflate the bubble in stocks. The liquidity will find it’s way into the commodity markets over the next two years, just like it did in 2007/08 when Ben tried to reflate the real estate bubble. Once this process begins, I believe it will initiate the bubble phase of the gold bull. This entry was posted in Uncategorized on June 24, 2013 by Gary. I’ll start off today with the stock market. As most of you probably remember my thesis for months now has been that this parabolic move in stocks would eventually start to stagnate, roll over, and probably at some point crash. As that process plays out I’m looking for liquidity to begin leaking into the undervalued commodity markets. Basically the exact same progression that happened at the 2007 top. I think that process began with the high-volume reversal on May 22. As you can see in the chart below, after that event the character of the market changed. Before that, every move out of a daily cycle low began powerfully. The initial thrust created momentum with follow-through. When stocks came out of their most recent daily cycle low, no momentum was generated. Stocks immediately retraced the initial thrust. That was followed by another powerful rally as the dip buyers again tried to push the market higher. But as we saw on Friday it also had no follow-through. While it’s always possible that Bernanke can throw enough money at the market to break it out of this range, and retest or make marginal new highs, I think the odds are better that we have started the stagnation/rollover process that I have been expecting. For the rest of the weekend report…. This entry was posted in Uncategorized on June 15, 2013 by Gary. As I alluded to in my previous report both stocks and gold are due to mean revert. Short-term the stock market is getting significantly oversold and if we get a down day tomorrow I would expect some kind of bounce off of the 1600 level. If that bounce fails and we break below last Thursday’s low it should confirm that stocks have begun an intermediate degree correction. Since I think there is significant risk that the cyclical bull market that started in 2009 is now topping I would take a break of the $1600 level as confirmation that an intermediate level decline has begun. Based on how artificially far the Fed has driven this rally, this should be a quite significant decline, possibly even filling the gap from January 2. If one has retirement funds invested in the general stock market I think after four years and a 153% gain it’s probably time to say “close enough” and exit this Frankenstein monster of a market that the Fed has created. This entry was posted in Uncategorized on June 13, 2013 by Gary. Tuesday interview with Al Korelin. This entry was posted in Uncategorized on June 12, 2013 by Gary. Major break in the dollar index today is signalling 15-20 weeks of declines ahead. This should be the fuel to drive gold back to test the old highs by early this fall. This entry was posted in Uncategorized on June 7, 2013 by Gary. This entry was posted in Uncategorized on June 6, 2013 by Gary. This entry was posted in Uncategorized on June 5, 2013 by Gary. There’s a reason why commercial traders are regression to the mean traders. In this business it is the one thing that you can absolutely bank on. It’s like death and taxes, it never fails. All markets eventually return to the mean. An appropriate corollary to this rule is that the further an asset gets stretched above or below the mean the more violent the regression is, and the further it will move past the mean during the snapback. You can see this clearly in the chart below. Notice that during the bull market from 2002 -2007 the S&P never stretched extremely far above the 200 day moving average (well until the final euphoria phase in 2007). Consequently each intermediate correction halted at or slightly below the 200 day moving average. This changed when the new cyclical bull market started in 2009. It changed because the markets were not allowed to trade naturally. They were warped by massive doses of quantitative easing. 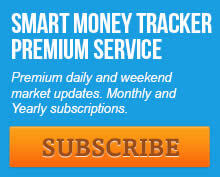 This caused markets to stretch much further above the 200 day moving average than would have occurred normally. The consequences of course were that when the corrections hit they unwound violently and moved much further below the 200 DMA than would have occurred naturally. This bull market is much more volatile than the previous one because the market is being driven by currency debasement instead of true economic expansion. 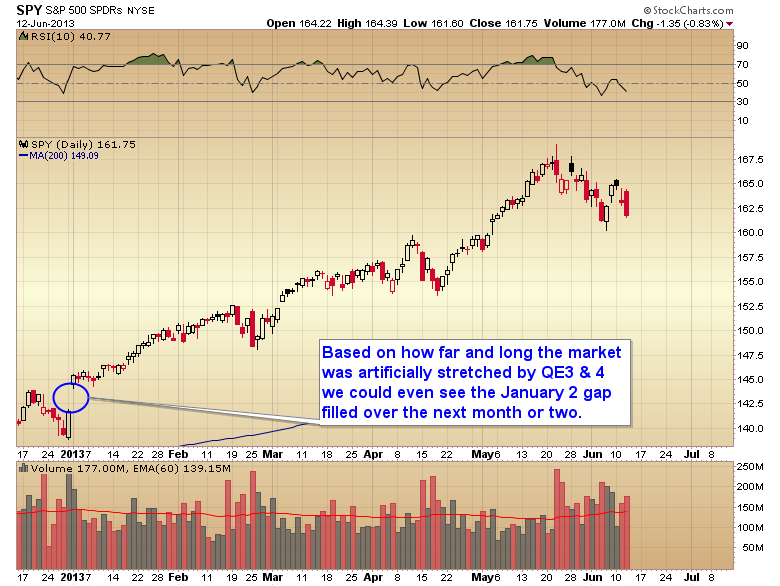 Now we are in a situation where the stock market has been stretched ridiculously far above the mean by QE 3 & 4. Trust me, Bernanke has not abolished the forces of regression to the mean. All he has done is guarantee that the regression is going to be many multiples more violent than it should have been. When this house of cards topples over, I think there is a pretty good chance it’s going to be even more severe than what happened in 2011. Also notice the red arrows marking major cyclical bull and bear market turning points. Notice the Fed warped the last cyclical bull market much higher and longer in duration than should have occurred naturally (he turned a 4 year cycle into a 6 1/2 year cycle). Consequently the forces of regression responded by triggering the second worst bear market in history. The current cyclical bull market, although not stretched as long in time, is extremely stretched in magnitude so the resulting bear market will almost certainly be exceptionally violent and protracted. Mean regression rule: Without fail liquidity eventually finds it’s way into undervalued assets. An appropriate corollary to that rule would be that liquidity will eventually find it’s way out of overvalued assets. Unless Bernanke has found a way to break the natural law of regression to the mean (he hasn’t) then at some point we are going to see liquidity flee the overvalued stock market. When it does it’s going to look for undervalued assets to land on. Nothing is more undervalued in my opinion than commodities in general, and precious metals in particular. Regression to the mean doesn’t just apply to assets stretched to the upside. It also acts to levitate extremely depressed assets, and the same rules apply. The further an asset is stretched below the mean the more violently the regression usually is once the selling exhausts. Considering that gold is now stretched about as far below the 200 day moving average as it was in 2008 the rally when it arrives should be every bit as powerful if not more so than we saw in 2009. In my opinion we now have the setup to drive either another C-wave as large or larger than the one out of the 2008 bottom, or this is the set up to drive the bubble phase of the bull market. This entry was posted in Uncategorized on June 2, 2013 by Gary.